Scandinavian cities perhaps offer some of the best swift stopover scenarios you could hope for: efficient airports to process you quickly into the country, quick and efficient public transport to process you quickly into the centre of the city and as much culture, architecture and entertainment as your average european capital is likely to throw at you. Just remember to remortgage if you plan on drinking! 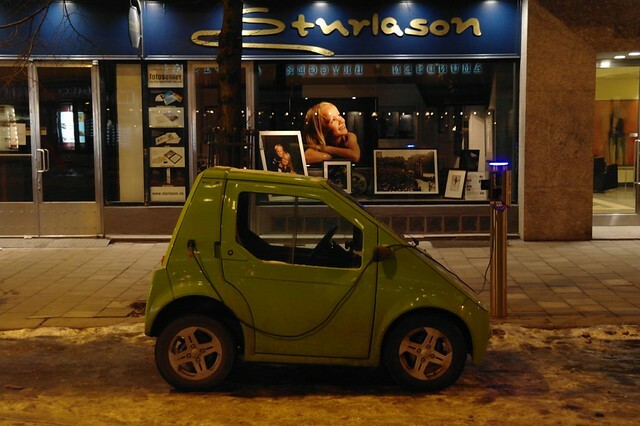 An Electric car in Oslo! Makes for a better picture than the airport train. Transfers from the airport are as smooth as can be, taking about 20 minutes to cover the 30+ miles to Oslo Central station. It’ ll cost you about £20 each way (don’t expect too many bargains in Oslo) and you can simply swipe your plastic at the turnstile instead of purchasing a ticket. That appears to be the Oslo way; in my stay there I didn’t see anyone using cash. It is also a convenient way to ignore your painfully weak dollars or pounds! Equally futuristically by British standards, I didnt once lose a wi-fi connection during my entire time on Norwegian property, even when 35000 ft up, so I used my time on the train to acquaint myself with Oslo centre on t’internet. 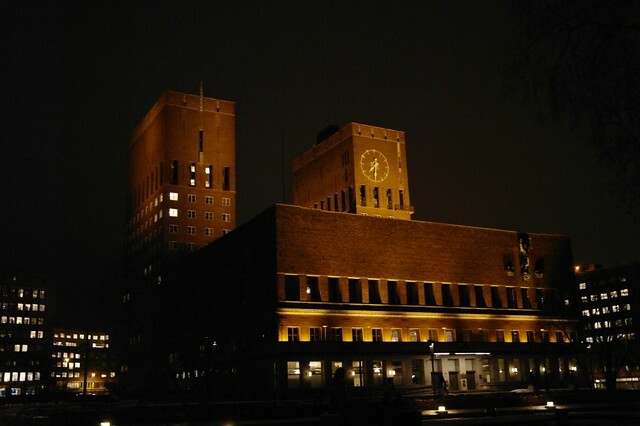 The city centre is compact enough to have a good stroll around so I walked from the station past the 500 year old Oslo Cathederal to my central hotel (P-hotels Oslo, only notable feature: very welcome under-floor heating in the bathroom!). Remember to look out for trams, they seem to be criss-crossing everywhere. 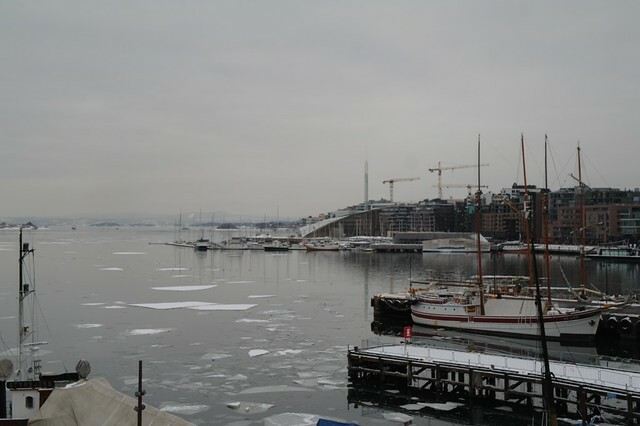 Having checked in, I headed straight across Karl Johan’s Gate in the middle of Oslo towards the harbour area, Aker Brygge. 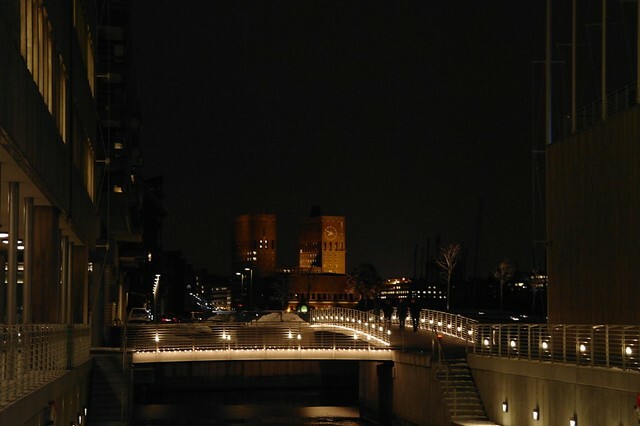 Aker Brygge Wharf has been redeveloped in recent years and includes a host of modern and trendy (if occasionally soulless) eating, dining and shopping options. All with cracking seaviews (fjordviews?) over the boardwalk and boats. There are plenty of outdoor dining options here that may be better suited to a visit in Summertime. 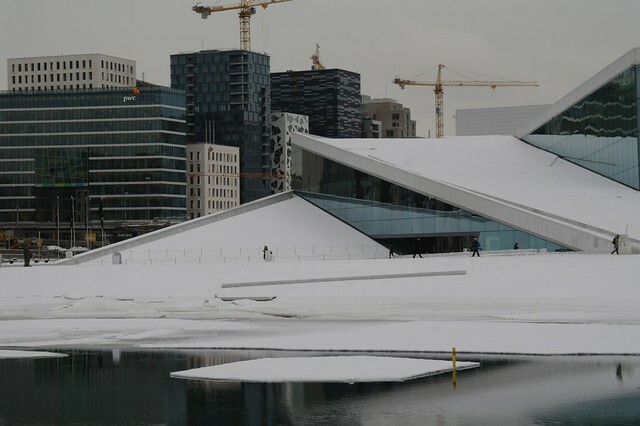 The cultural and architectural highlight of this area is the The Astrup Fearnley Museum of Modern Art and a stroll along the waterfront from the Town Hall and past the Opera House will inevitably lead you here. By this point, having taken in the sights for a couple of hours, the bitter cold had kicked in – it sneaks up on you!! 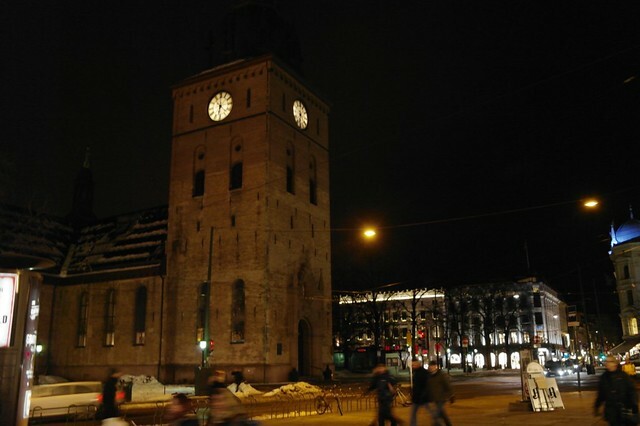 I made for the Amundsen Bryggeri and Spiseri between Karl Johan’s Gate and the town hall. This was lively and cosy with an awesome beer selection, hearty local dishes, big screen football and micro-brewery. Just my cup of tea. 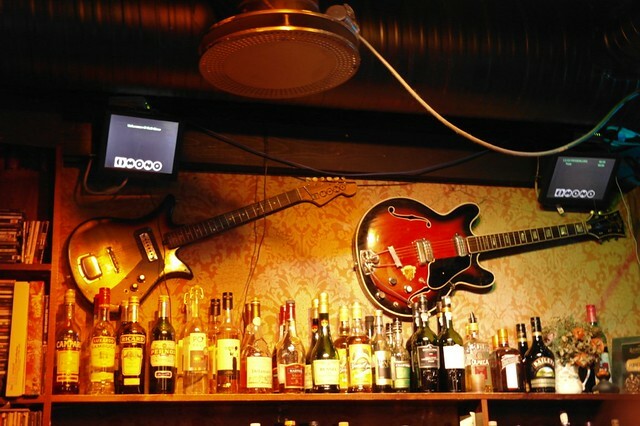 After Dinner I sampled a couple of sports pubs and then made for Last Train, “Oslo’s oldest rock bar”. This is a cool little pub oozing with character and on the right night you can watch a bit of music here too. 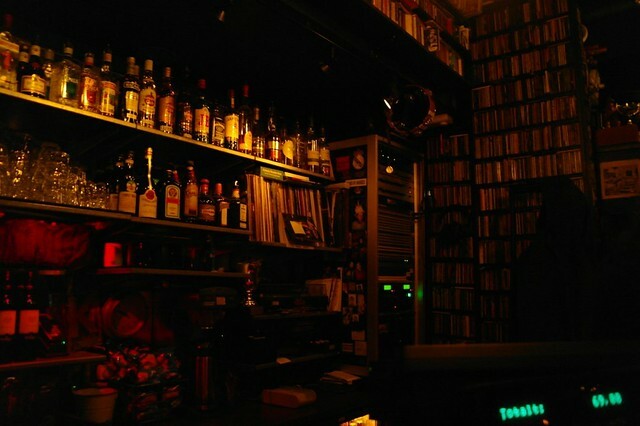 Another bar you might like to sample if you like your music is Cafe Mono; reasonably priced local beer, relaxed atmosphere, a place outside to smoke and regular live bands and artists. 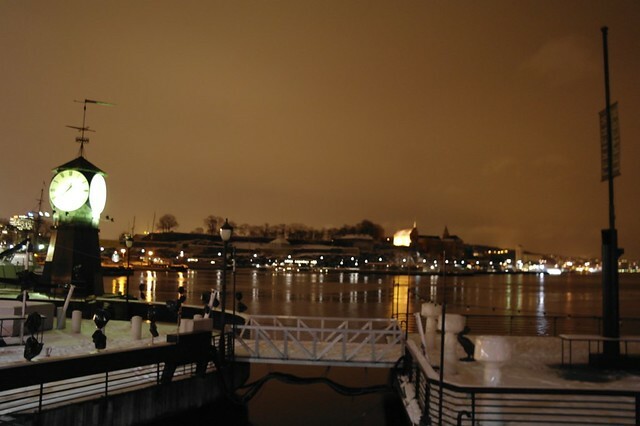 With the dim daylight to guide me the next day, I took in some of the shopping streets and walked from the sensational new Opera House East of the city centre, along the seafront back to Akker Brygge via the fort. There are all the shopping options you’d expect from a capital city like this and a varied assortment of smart architecture to enjoy. I found the indoor markets and malls nearest the station offered the most fruitful ground for bargain-hunting. The place ain’t cheap, so stock up at the supermarket if you don’t want to spend half your budget on dinner at the airport like I did. All in all I clearly barely touched the sides during my brief time in Oslo. As stopovers go though, there is plenty that you can squeeze in here and plenty of places to hang out in over a coffee or beer in what felt like a friendly and stylish capital city. Britons visiting in the winter can expect to come home deeply confused by the Norwegian talent for gritting streets and keeping citizens warm. We could learn a thing or two! If I get to go back I’d choose a warmer time to enjoy the parks, check out a few more of the numerous galleries, venture a little further from the sentrum into the happening suburbs and enjoy a spot of ski jumping.